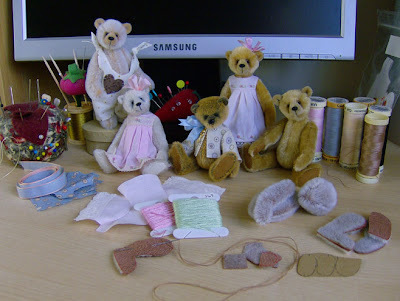 Work in progress, sometimes I just seem to have such a pretty selection of fabric, threads and bears on my table. So I decided to share a photo of what I have been doing today. It has been a lovely day here, the sun is out although there is an icy wind, the kitties played outside for a few hours and I seem to have actually got some stuff done. I hope everyone else is having a good day.